Combine your Demo-Tape and Business-card! Your demo-tape is also your business-card. 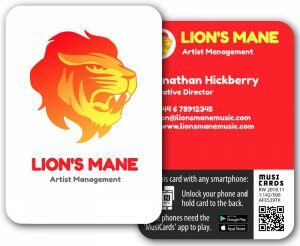 Hand out your business-card and let your audience access your creative content (demo reel, mixes, playlists, videos) as well as your contact details and social media profile anywhere, anytime. As a DJ, a musician or an artist you often find yourself in dynamic situations, surrounded by a large potentioal audience. Music conferences, festivals and Parties are the ideal situation to make new contacts and enlarge your fan-club. But handing over a CD or USB-stick is impractical for your audience cannot access your content right on the spot. A business card with links to music streamers or websites is also irrelevant for they involve typing-in and searching – a process that takes too long. You need a simple solution that is both practical and apealing. MusiCards Offer a solution that balances the need to have your media in a physical form and the wish to hand it over quickly and carry it around easily. As a musician you don’t have to carry around a stock of CDs and your audience doesn’t need a CD-player to listen to your music. As an artist you can easily display your art without the weight of big canvases and fat sketch-books. Just hand over your MusiCard and give your audience immidiate access to your content, website and social media profiles. 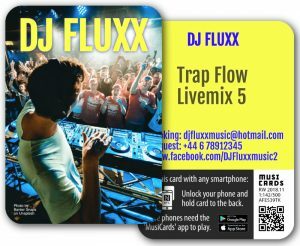 Design the card as you wish and make it also you business card. The MusiCards allow your audience to access your content right when you hand it over using their smatphone. No need for additional gadgets like a CD-player or a computer. No need to spell an email adress or type in a link. The MusiCard can be design as you wish – feature your latetst album cover picture or your signature and create a unique and stylish MusiCard. Your landing page can feature all kinds of media content – playlists on all music streamers, photos, videos and texts. You can Add links to your social media profiles and website, display your contact details and easily engage with your audience. All links can be changed in any time, even after they have been distributed. You can share your newest creations, update your playlists and keep your audience up to date with your art. Design the cover of your MusiCard – add your album cover photo/logo. Choose a quantity (minimum 100 cards per model). Create your landing page on the MusiCards platform – add links to your website/social media profile, provide your contact details and promote yourself. The cards will be produces and deliver to an adress of your choice. Hand over you MusiCard and grant people immidiate access to your media. Your content can be stremed on the spot – all you need is a smartphone. Using the NFC connection/the MusiCards app your landing page will be opened automatically when you tap the MusiCard to your smartphone. Alternatively there is a QR code on the back of the MusiCard. The QR code can be read with an app on Android phones/with the camera on the new models of iphone. Redirect your audience using the landing page. Music – can be streamed on most of the popular platforms: Spotify, AppleMusic, youtuce, Deezer and more. Websites/Social media – provide links to your Facebook page, intagram profile and website. Contact details – let people the opportunity to get in touch with you. links are provided by the issuer. MusiCards work with all streaming services on which the content is available. Playlists can also be copied over to all streaming services for you. The integration ensures the correct app is started if installed on the user’s device. Add links to your social media profiles and provide contact details. This is especially useful when the card also serves as a business card. All links can be changed at any time, even after the cards have been distributed. Update your content, add new music, share your latest creations. As a MusiCards issuer, you can track and analyse user behaviour down to the details. Analyse the popularity of your content among your audience. Take advantage of the landing page and reach out to your audience. Engage with users the moment they want to stream your media – Display upcoming concerts nearby, surprise loyal users, honour a sponsor.